Level Ten’s resources include executive coaching and leadership development conducted by a licensed professional with significant success in this area of expertise. Whether enhancement of existing leadership, mentoring, or training of new management is desired, we are able to fulfill this objective and equip the entire enterprise with broader and deeper skills in this area. 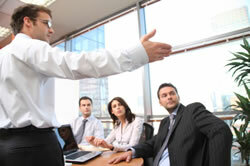 Effective leadership takes more than just traditional business acumen and training. At Leven Ten Consulting Group, our licensed leadership development professionals will assess and evaluate your core managemerial team, documenting any potential organizational shortcomings. Developing leadership takes a commitment from every level of the organization. Our practical approach to effective leadership development inspires action and achieves results by developing core leadership competencies across entire organizations. Increase organization performance and productivity, improve company culture, and solve issues pertaining to employee retention and motivation.